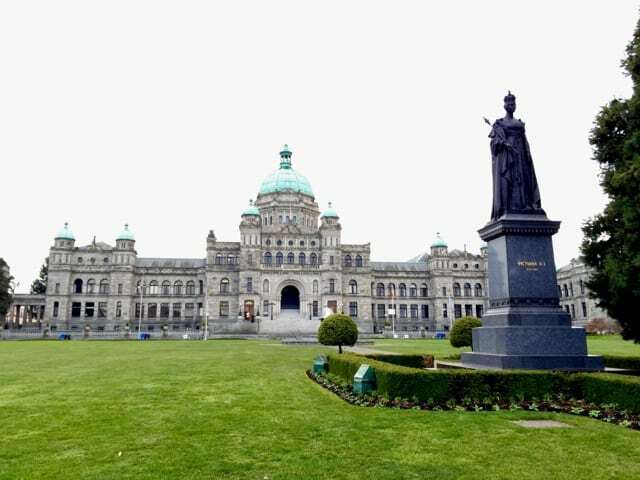 The Parliament Buildings in Victoria. What to do in Victoria, B.C. Stroll around the historic centre – Victoria was named after Britain’s Queen Victoria in the mid-19th century and is one of the oldest cities in the Pacific Northwest. The historic centre hugs a beautiful harbour (the Inner Harbour) and boasts stunning examples of 19th century Victorian/Neo-baroque architecture. As you stroll around the harbour, your attention will immediately be drawn to the stately Empress Hotel and the Parliament buildings. A few blocks away, you’ll find the Gothic-style Christ Church Cathedral. A lovely street to explore is Government Street which starts near the Empress Hotel. Keep walking until you hit Chinatown, the second-oldest Chinatown in North America (after San Francisco). If you love tea, drop by the Silk Road store which houses an incredible collection of teas! The Parliament Buildings houses the Legislative Assembly. 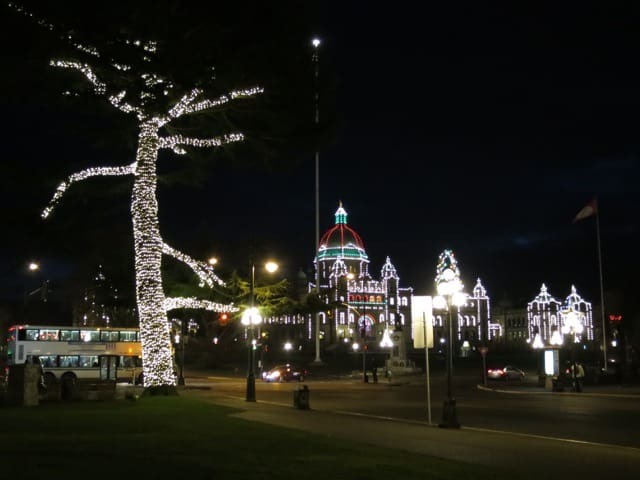 Visiting Victoria during the Festive Season is a treat! The lights are stunning! Whale-watching – The waters around Victoria are rich with marine life, including a variety of whales. The orcas or killer whales are easiest to spot but if you’re lucky, you may also spot minke and humpback whales! You can book a whale-watching tour with certified naturalists in downtown Victoria or you can choose to book in advance. Indulge in the freshest seafood! – When you’re in a city that’s right next door to the ocean, I recommend you try the seafood! Victoria has the unique distinction of having the Pacific Ocean at its front door and fertile land at its back door. This has created a vibrant farm/ocean-to-table movement, ensuring that whatever you find on your plate is the freshest anywhere around. Restaurants I truly enjoyed include 10 Acres Bistro, Q at The Empress and Aura. Aura, with Chef Ito at the helm, serves a sublime Asian-inspired menu with spectacular harbour views. Try the scallops and when in season, the sablefish; truly the stuff of foodie dreams! 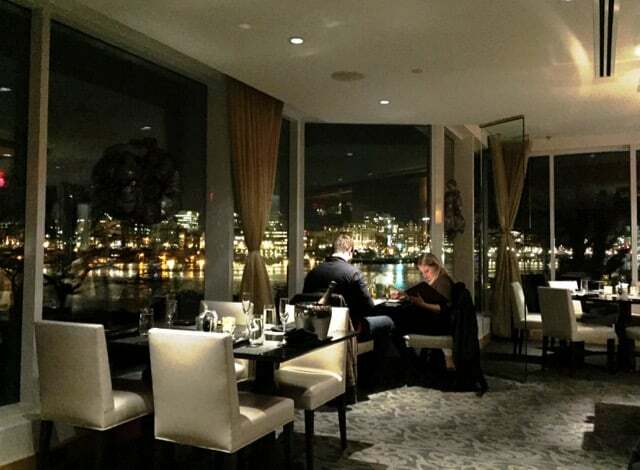 Dining at Aura, with a spectacular harbour view. 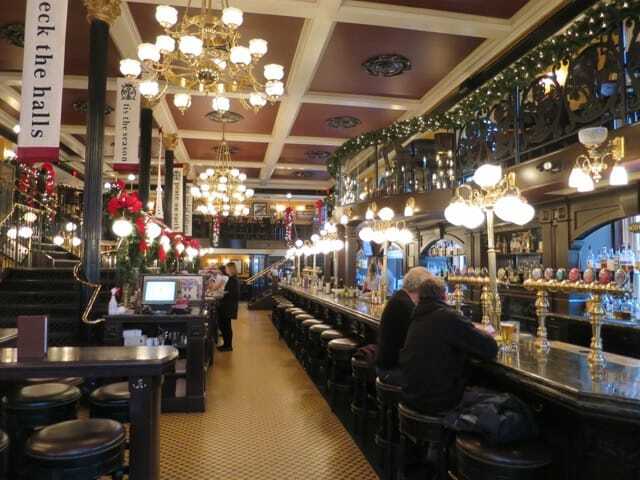 Have a pint in a local pub – there are several stunning English or Irish pubs located in Government Street. The range of ales, from local to imported brews, is impressive but the gorgeous historic interiors will grab your attention! Visit one of these pubs for pre-dinner drinks or in the evenings and strike up a conversation with the friendly locals. I can recommend The Irish Times and The Bard & Banker. The Bard and Banker in Victoria. Visit a micro-brewery… or two! – If you’re impressed by the ales in the pubs, visit the micro-breweries! Craft-brewing has a long history in Victoria and these days, the city has a multitude of craft brewers within the city limits. Start at Spinnakers, Canada’s oldest brewpub (they also serve a great farm-to-table menu). Other brewpubs I can recommend include Canoe Brewpub and Swans Brewery. Pick up a Craft Beer Map at the Victoria Visitor Centre. If you love beer, take note of the annual Victoria Beer Week – a celebration of craft beers paired with delicious local produce! Discover the natural wonders of Butchart Gardens – the world-famous Butchard Gardens is situated outside Victoria (about a 30-minute drive) and shouldn’t be missed! The gardens can trace its history back to the early-20th century when Jennie Butchart created a garden in an abandoned quarry. These days, the Butchart Gardens, a National Historic Site of Canada, attracts more than a million visitors each year who come to enjoy the gorgeous flowers and the stunning landscaping. The gardens are open all year round. 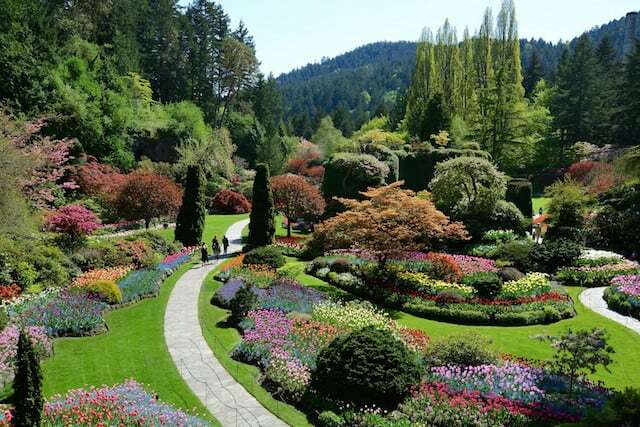 Butchart Gardens (image courtesy of Butchard Gardens). During the Festive Season, the gardens are transformed into a magical wonderland with thousands of fairy lights and beautiful displays. And while you’re there, have a lovely meal at The Dining Room, which is located in the former Butchart residence. The Dining Room consistently ranks as one of the Top-100 restaurants in Canada. 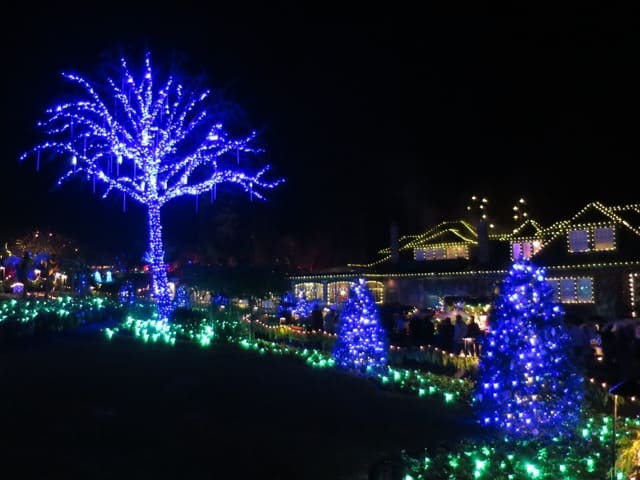 The Christmas lights at the Butchart Gardens. Afternoon tea at The Empress – The Fairmont Empress, or simply The Empress, is one of the oldest and most famous hotels in British Columbia. 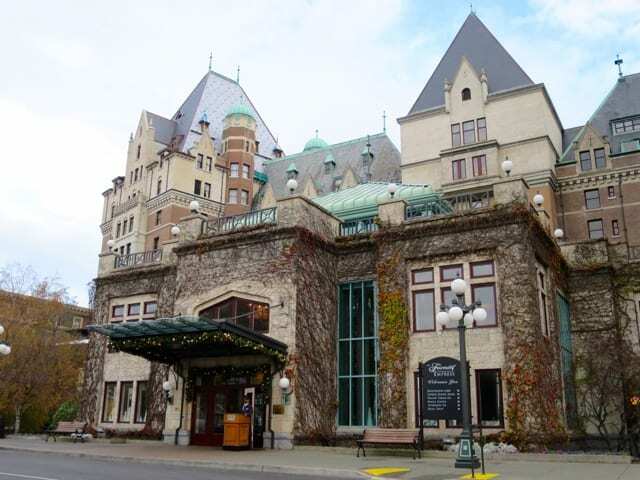 The stunning Edwardian, chateau-style hotel, listed as a National Historic Site of Canada, is popular as an afternoon tea spot, but the grand interior is the biggest attraction. Step back in time at Craigdarroch Castle – The Craigdarroch Castle, located just outside the city centre was completed in 1890. The castle was built by the Duinsmuir family, at the time the richest in Western Canada. With its grand Victorian-era interior, stained glass windows and intricate woodwork, the castle provides visitors with fascinating insights to the history of the Canadian Pacific. Find out which famous movies were filmed here! – The Dunsmuir family also commissioned the construction of Hatley Castle, a Scottish baronnial style castle situated just outside Victoria. The Castle is surrounded by resplendent gardens – there are Japanese, rose and Italian gardens – and houses a museum. The castle has been used as a location for countless movies and tv series. Fans of the X-Men movies will recognise this castle; scenes of “Professor Xavier’s School for Gifted Youngsters” in the movies were filmed here. Go wine-tasting – yes, there’s a thriving wine industry on Vancouver Island! The first commercial vineyard was established on the island in 1970. 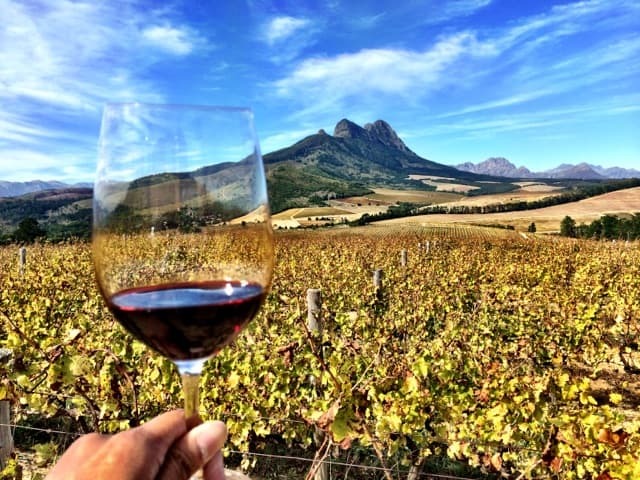 Today, there are over 40 wineries that produce a selection of grape varieties such as Grüner Veltliner, Gewürztraminer, Pinor Gris/Noir and Merlot. The wineries are located between Victoria and Cowichan Lake, and many offer wine-tastings and meals. Many have beautiful surroundings which are perfect for a picnic! The closest wineries to Victoria are De Vine Vineyards and Symphony Vineyards (near the ferry terminal in Swartz Bay). There’s a Wine Route that runs from Victoria in a northerly direction – simply follow the burgundy/white ‘Wine Route’ signs. 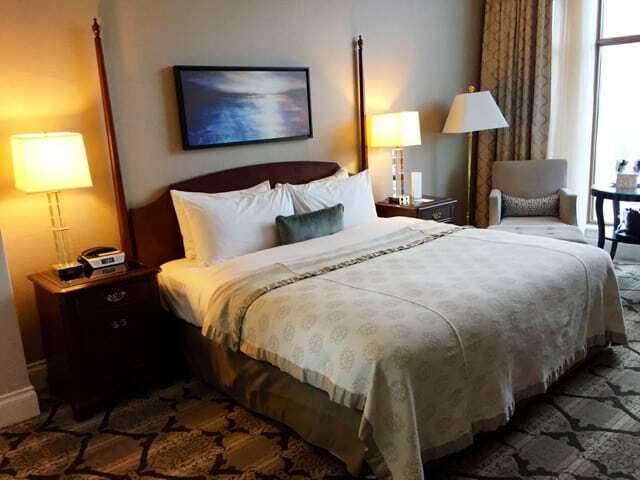 Where to stay in Victoria, B.C. 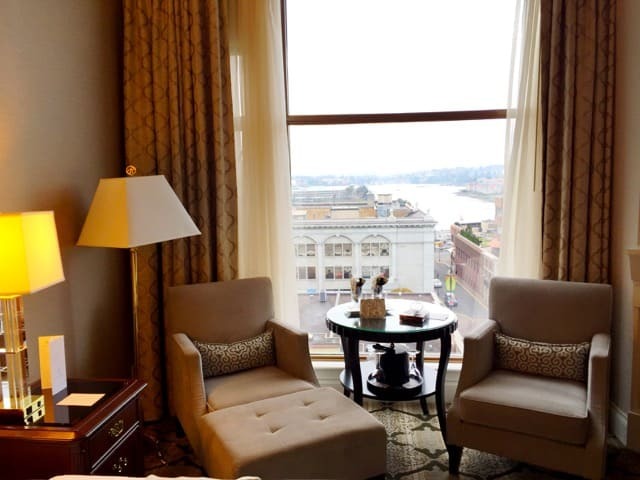 I stayed at the lovely Magnolia Hotel & Spa in downtown Victoria, a short walk from Government Street and the Inner Harbour. This luxury boutique hotel was recently voted as one of the top hotels in Canada and I totally agree. My room, with gorgeous harbour view, was spacious and the bed was very comfortable. My room at the Magnolia Hotel & Spa. A lovely view of Victoria’s Inner Harbour. The staff were happy to help with any query and I especially enjoyed the little touches like providing their guests with walking maps of Victoria (they have excellent tapas and craft beer walking maps) and the fabulous turn-down service with hot chocolate! I can definitely recommend the Magnolia Hotel for your stay in Victoria. BC Ferries operates between the mainland and Vancouver Island. Victoria has an international airport with flights to Vancouver and Seattle-Tacoma. Sea-planes and helicopters also connect these two cities with Victoria’s Inner Harbour. You can also take a bus or drive from Vancouver via ferry from the Tsawwassen terminal on the mainland to Swartz Bay near Victoria. You can also opt to take the Prince of Whales passenger-only boat services between Vancouver and Victoria’s Inner Harbour (this mode of transport has the added advantage of a high probability of spotting whales along the way!). For more info, visit Tourism Victoria. Read more about Vancouver Island on Velvet Escape. Note: a big thank you goes to Tourism Victoria and Destination British Columbia for your fabulous hospitality. As always, all views expressed above are mine and mine only. The Gardens were easily by favorite place to go in Victoria. A ways out of town, but worth the drive up the Saanich Peninsula!